Each event, we make predictions and put our reputation on the line, to be laughed at and mocked by the charming degenerates who revel in our demise. Soak in our failures, you handsome bastards. I’m new to putting my predictions to paper, and it’s made me dig into the fighters more than ever before. In some cases, I’m astounded at how wrong I am about someone. Another case of ‘a little goes a long way’. 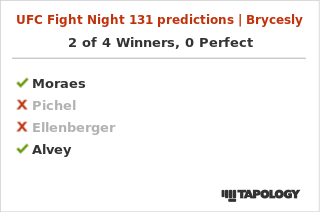 This week is another wash for exciting fighters so my picks are easy. 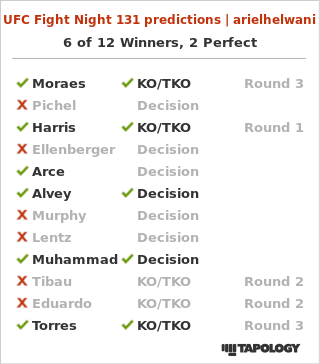 Going with a couple upset picks in Moraes and Vinc Pichel. Pichel is my hot underdog pick of the week due his stats and win count being so close to the record of Gregor Gillespie. Who do you think will win between ‘Rivera vs. Moraes’? We’re looking to hear from fellow fans and fight degenerates. You’re as incoherent and over-confident as we are in your predictions. Get your keyboard out and put your money where your mouth is in the comments!